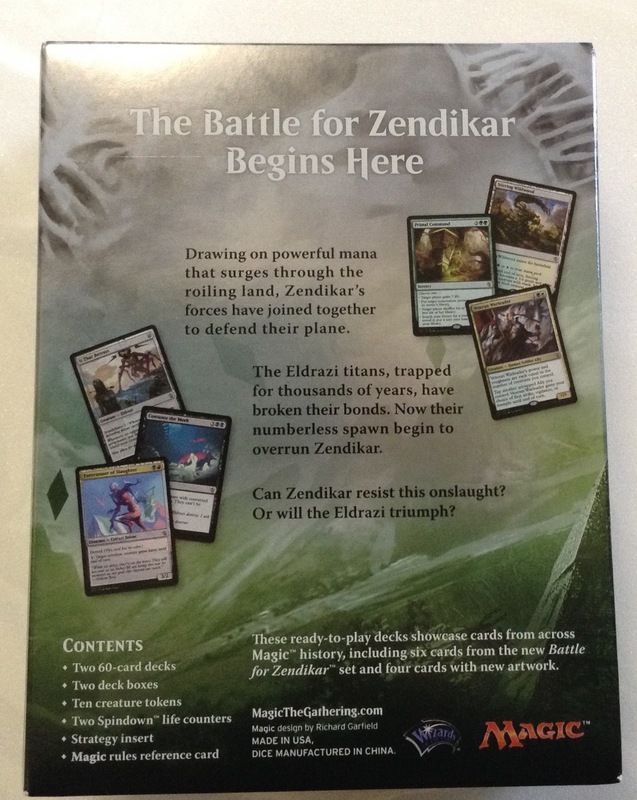 I for one am quite psyched about “Battle for Zendikar,” the next large set of MTG cards coming out in October. I missed Zendikar the first time around, since I wasn’t playing at the time. But the effects of that set have rippled through the gaming scene enough to where I know it was a big deal. 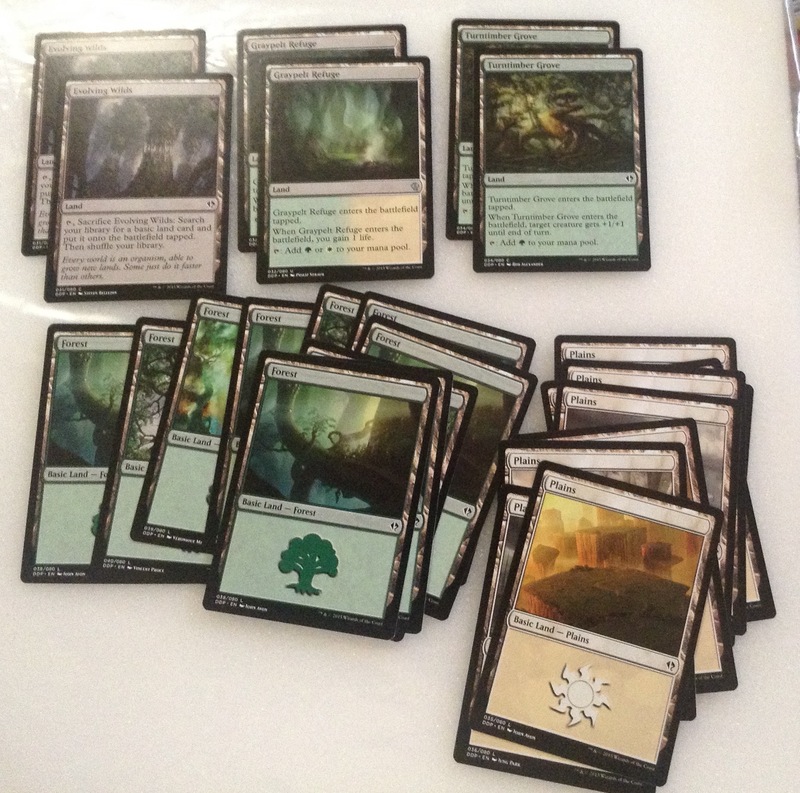 Everything from Fetch Lands like Verdant Catacombs, to full-art Zendikar basics are very sought after. And this isn’t even adding in the eldrazi bosses! The wizards have a little rotation…I should know by now. I am obviously a collector of duel decks, and certainly wasn’t going to pass this one up. The rotation goes like this…Duel deck in the fall just before rotation, that features cards with new mechanics, Duel deck in the spring featuring two planeswalkers, This duel deck is of the first type. It features a few new cards from the upcoming set, and spoils some of the mechanics. This time those mechanics are Devoid, Awaken, Ingest, Landfall, and Level-up, and Annihilator. I purchased my copy of the deck at The Tangled Web in Spartanburg SC for $19.99. I think you should go there now and get a copy…I don’t think this one is going to warm the shelves! So how did my unboxing and initial play go? Read on for a review! 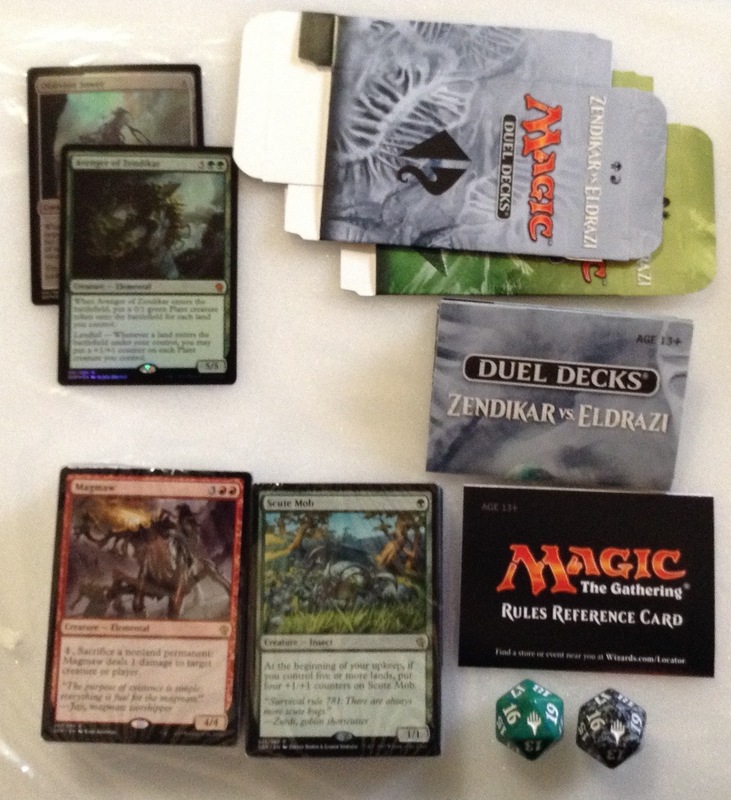 The Duel Decks, Zendikar vs. Eldrazi, came in the same kind of package as the last few. It doesn’t use heavy plastic, but lighter more recyclable stuff. 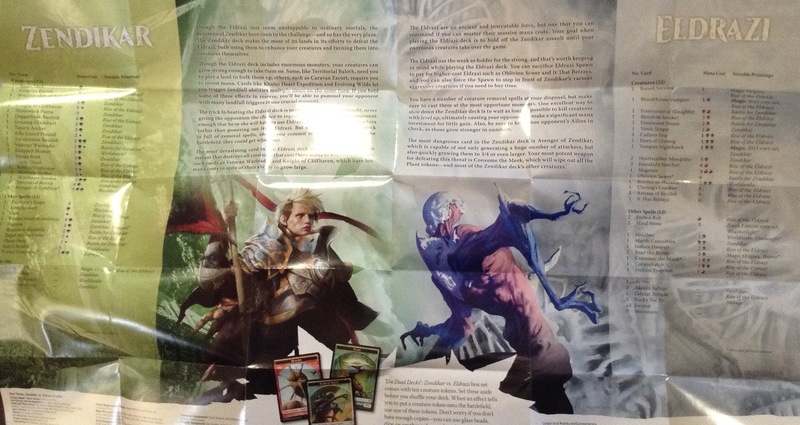 It is made of thin poster-style cardboard. Getting the seran wrap and the cardboard off reveals a thin blister covering a thicker black tray. Here are the pieces that I removed from the package. The art is good. Aren’t the Eldrazi ugly things! They look like mutant-jellyfish-human-aliens. I am going to go over the Zendikar deck first, photographing the cards, and mentioning what is good about those cards specifically. The first cards are the rares. This is something I have noticed recently about the intro decks as well. Rares are on top. No matter what kind of card they are. 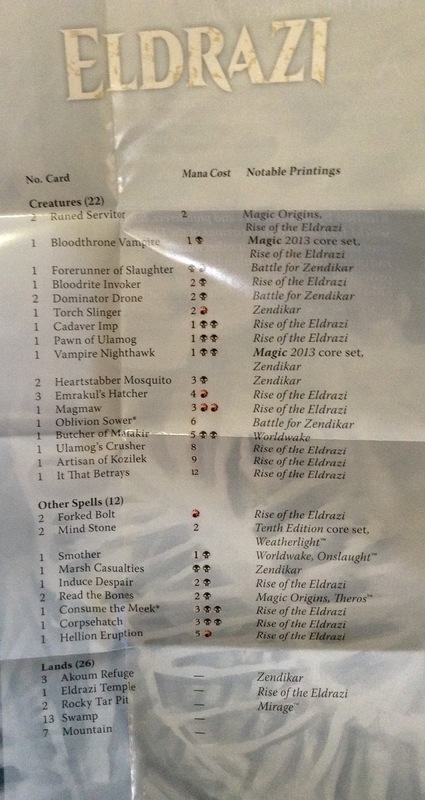 Probably the most notable here is Primal Command, a real game-changer. But none of these are junk rares. Every one of them is good. And Veteran Warleader has the potential to be HUGE. Lots of cards with landfall. These cards would make Garruk very happy! Large creatures that fight and love ramp. Also notable, the card with level up. Khalni Heart Expedition and Harrow are two ways to trigger landfall on your opponents turn. There are other ways, however. Clearly Landfall has to work in order for this deck to win! We also have It that Betrays. A reprint. But notable. 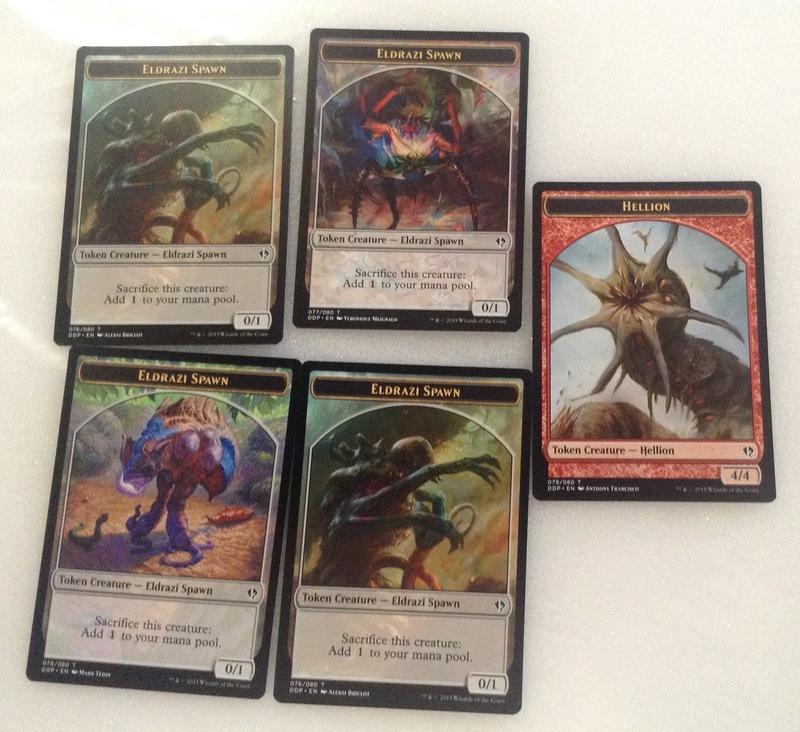 There are also some more Eldrazi. Ulamogs Crusher and Artisan of Kozilek. I’m highlighting Corpsehatch because it mentions the 0/1 Eldrazi Spawn. They are essential to making this deck work. This deck ramps with them, but also requires sacrifices. The lands. 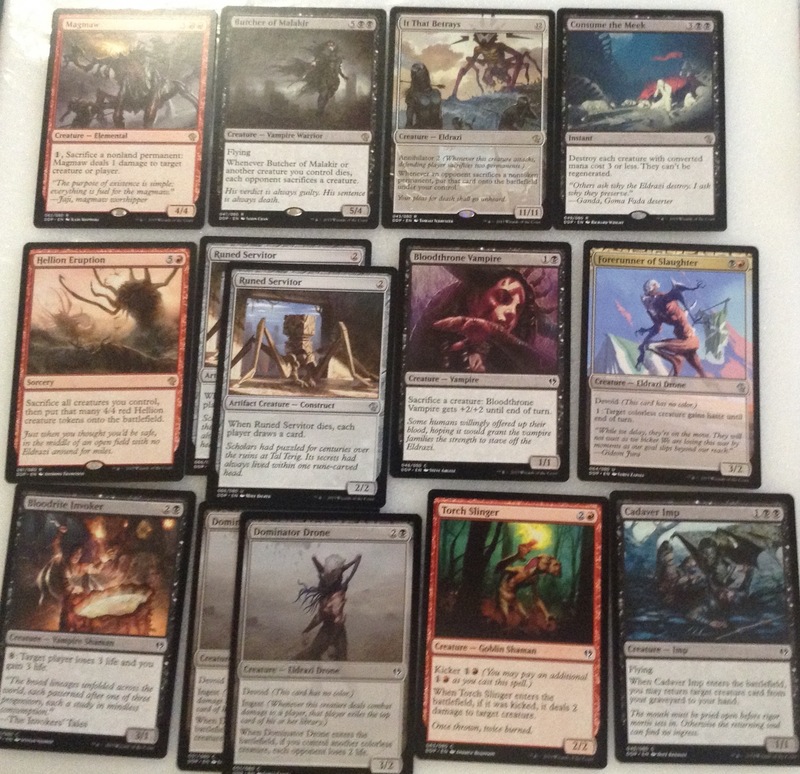 Refuges, Fetches, and Eldrazi Temple for flavor. You get these five tokens. 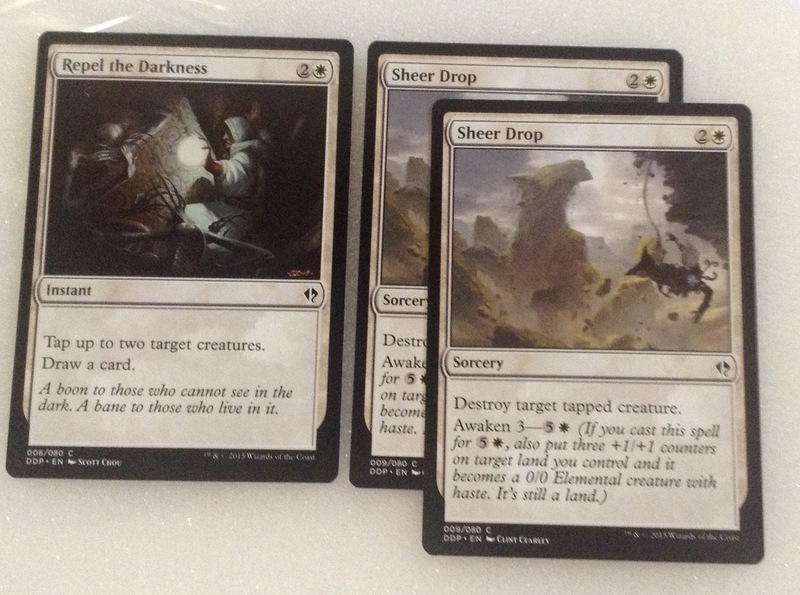 Three different printings of Eldrazi Spawn, and a 4/4 Hellion. Duel Decks are maybe the most flavorful regular releases from the wizards. These tokens really add to the story of what is happening during The Battle for Zendikar. HOW THE DECKS PLAY OUT. Me and the SpartanKid have played four matches, and it is 2 and 2. (2 wins for each deck.) This makes it great for me to write a review! But it also says something about the decks being balanced against each other. Both decks are ramp decks. Both decks use tokens. 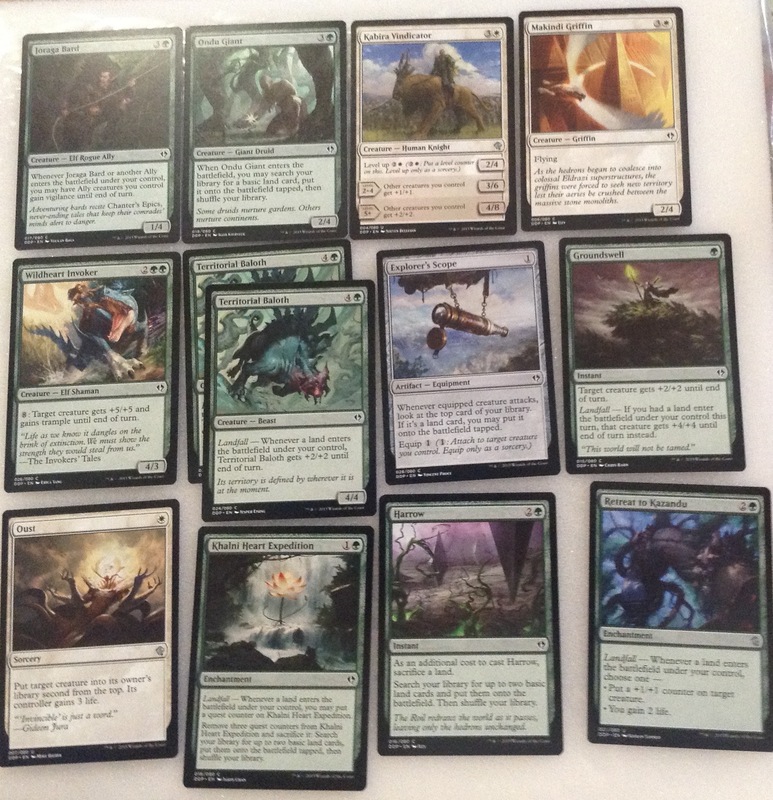 Both decks have very large creatures, however the Eldrazi have an edge here. On the other hand Zendikar can do something with its tokens besides sacrifice them. 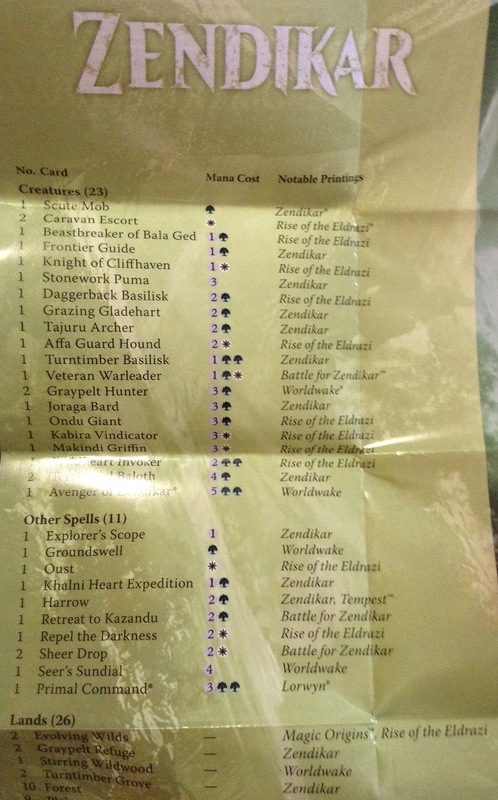 The first two matches were won by the Zendikar deck. Primal Command was an ESSENTIAL card to play correctly. 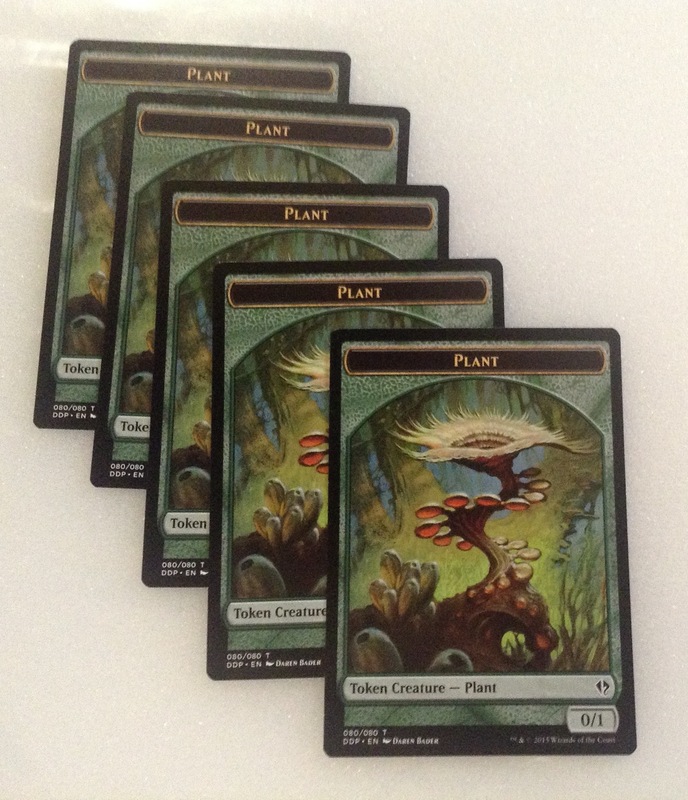 When Avenger of Zendikar entered the battlefield, lots of plant tokens were produced. Then the Avenger was targeted and killed. But the Primal Command lets you shuffle him back into your library and then tutor him back out. Awesome! So that meant even more plant goodness on the next turn. The turn after that, Evolving Wilds became the important card. (THAT’S RIGHT! Evolving Wilds is GREAT in this deck. Probably the only way, though.) When the evolving wilds entered the battlefield, it triggered Landfall on the avenger, and all ten of those plants got a 1/1 counter. 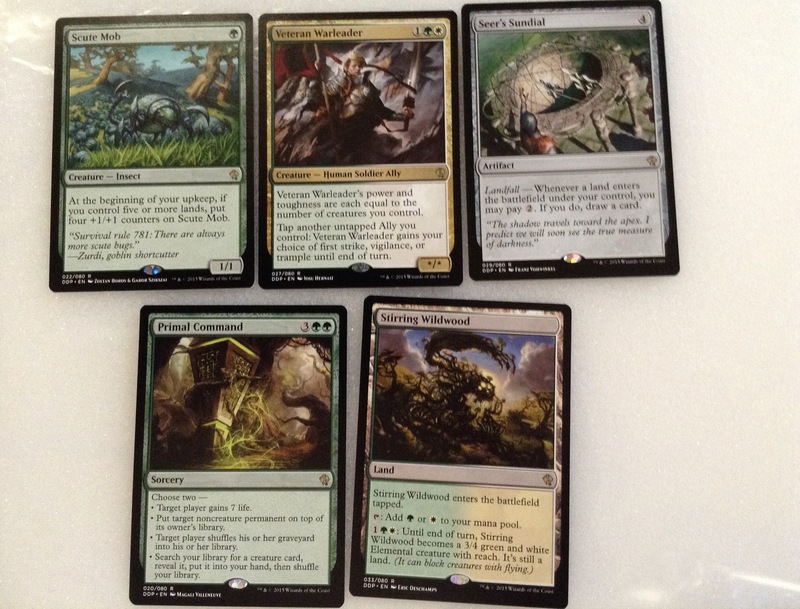 Then you crack the Evolving wilds and get another land, triggering Landfall again. And GG! You just swung for 20+! 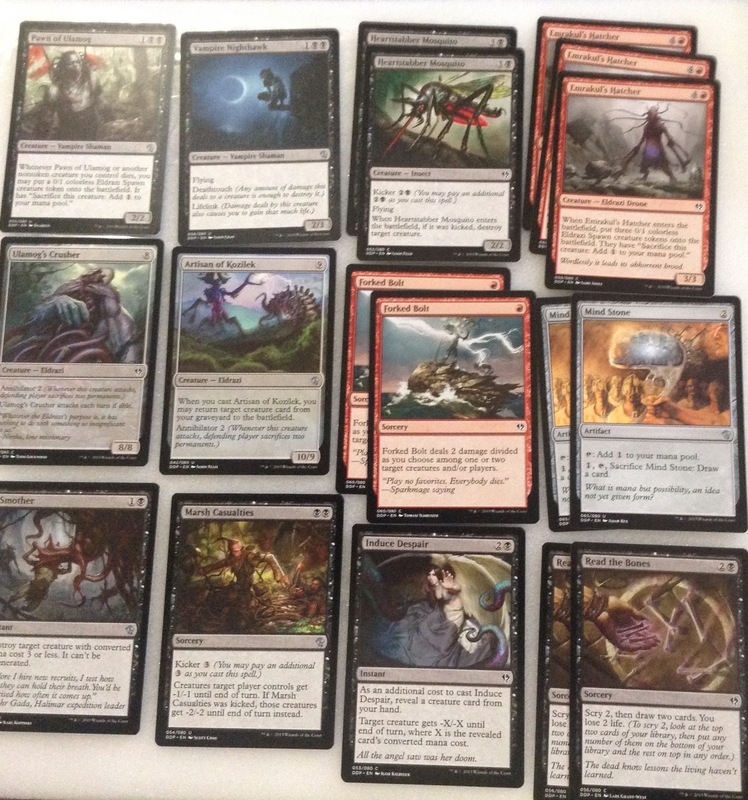 And all of the ways the deck gets land and triggers landfall really make it work. While it is a fattie beatdown deck, it is more of an overrun deck. Even if the Eldrazi sweep away the plant tokens with Marsh Casualties or similar, the creatures in the deck are still pretty formidable. 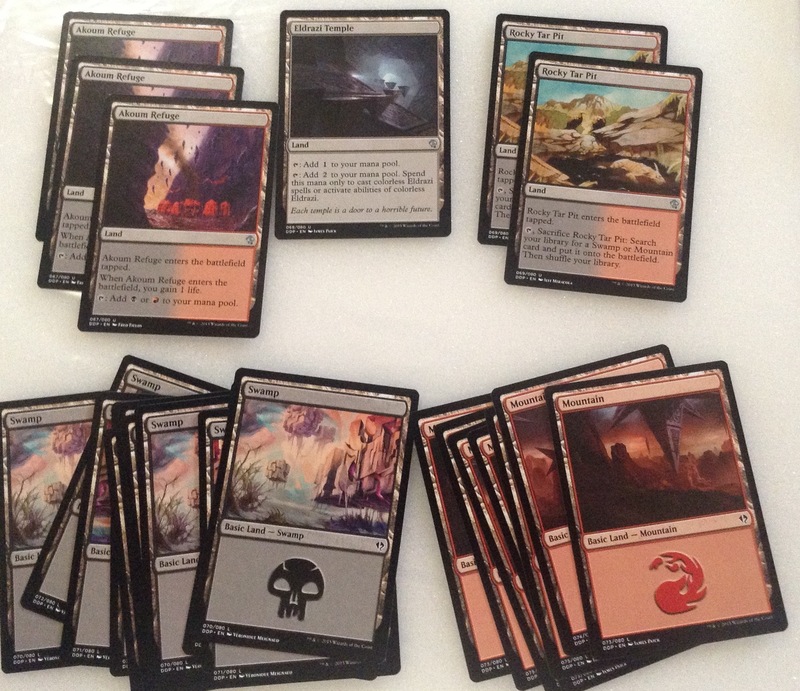 And every game we’ve played there has been like fourteen or more land on Zendikar’s side of the battlefield. Then there are tricks like Retreat to Kazandu…an enchantment that has landfall abilities that either put counters on a creature or gain life. Remember, Evolving Wilds is GOOD in this deck. The second two matches were won by the Eldrazi deck. 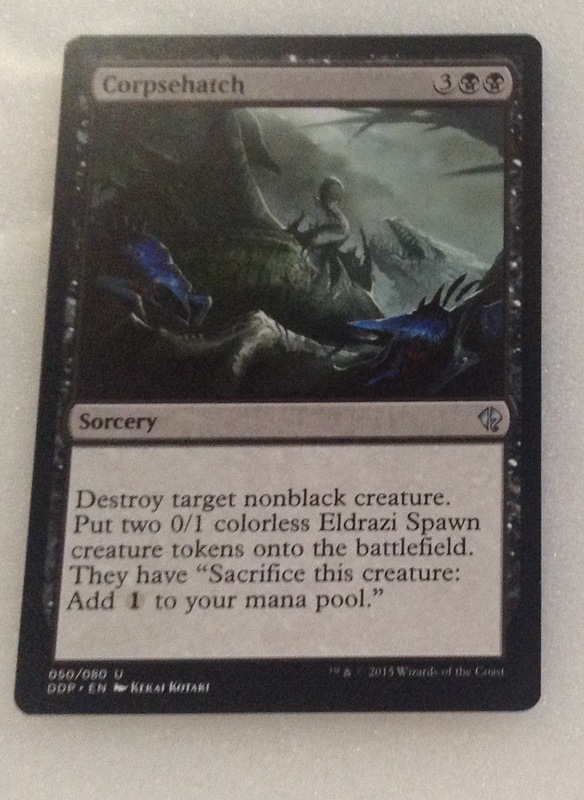 The Eldrazi win by finding advantage by producing Eldrazi Spawn tokens, which can be sacrificed for colorless mana, or sacrificed for other purposes. They also can just be blockers if you are in a pinch. Which seems to happen quite a bit with this deck. There are chump creatures, the tokens, and then the massive Eldrazi which are normally un-castable, so you have to buy as much time as you can. A couple of favorite tricks…Butcher of Malakir…whenever a creature you control dies, the opponent has to sacrifice a creature. Meaning that the Eldrazi Spawn tokens become Cruel Edict, but at instant speed. YAY! There is synergy here with Bloodthrone Vampire…he gets bigger when you sacrifice things. These kinds of tricks work really well in Commander. But with the level of ramp found in this deck, you get to use them here! So that tells you the other half of the story. 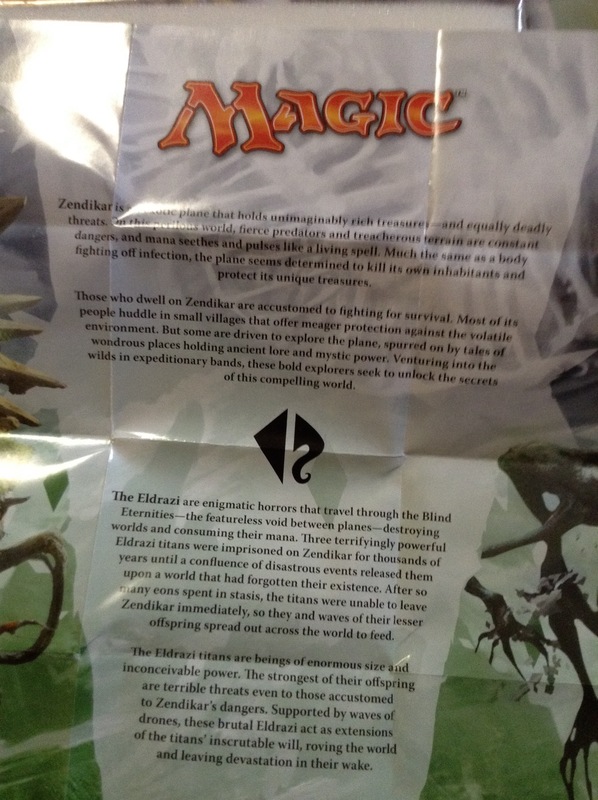 The Eldrazi themselves are winners. Period. They can be removed, Ousted, Etc. But they are winners if not answered. Ulamog’s Crusher and It that Betrays have Annihilate 2. The opponent has to sacrifice two permanents when they are declared as an attacker. Artisan of Kozilek has it also, but when you cast it you also get to reanimate something from the graveyard. 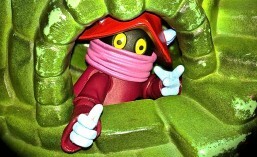 The new guy, Oblivion Sower, hasn’t shown up yet. He is meant to have synergy with the new cards with Ingest. The deck has a few Dominator Drones, and when they attack the player exiles their top card. Playing Oblivion Sower puts even more cards in the exile zone, and then you can put the exiled lands into play for whatever nefarious purpose you have planned! Of the two decks, I prefer the Eldrazi. All those vampires and black cards are just really good. 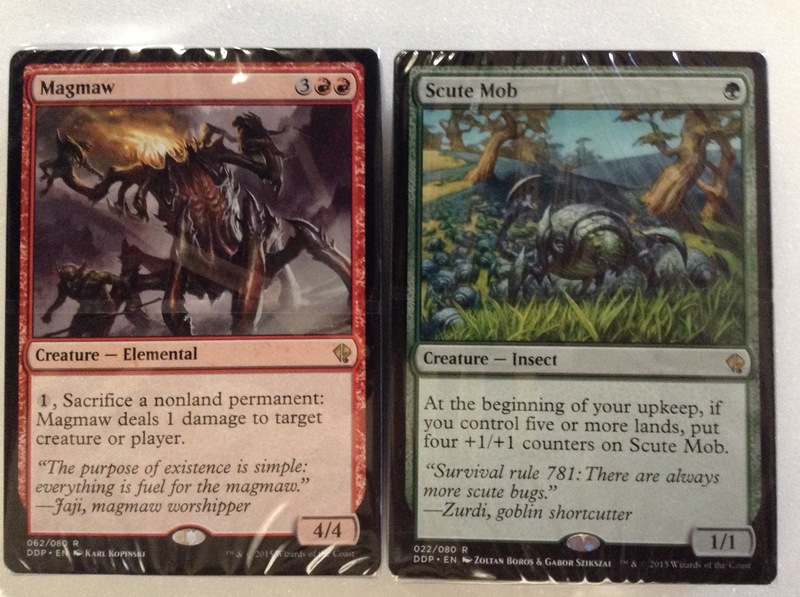 But there is no denying the goodness of Primal Command and all of the Landfall abilities the other deck can swing. I’d say this is one of the funnest duel decks I own. 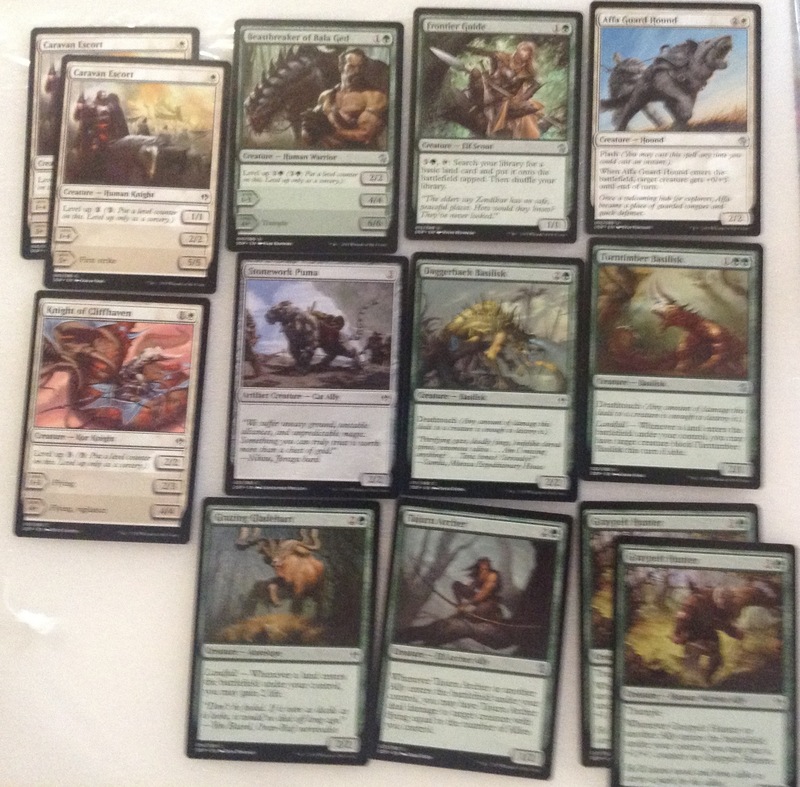 It is every bit as flavorful as Elves vs. Goblins and Liliana vs. Garruk. I have to give this deck a solid 5/5! The only real complaint I have is similar to the other complaints I have had about Duel Decks. This time the deck comes with lots of tokens, but those tokens don’t fit in the boxes. 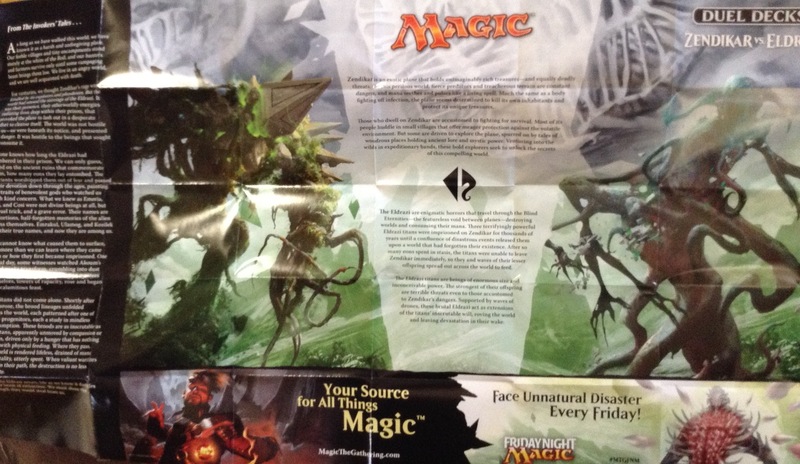 In fact, you can only fit two plants or two Eldrazi Spawn in either deck with the rest of the cards. This product has flavor, is fun, has allternate art cards (I hadn’t mentioned that!) 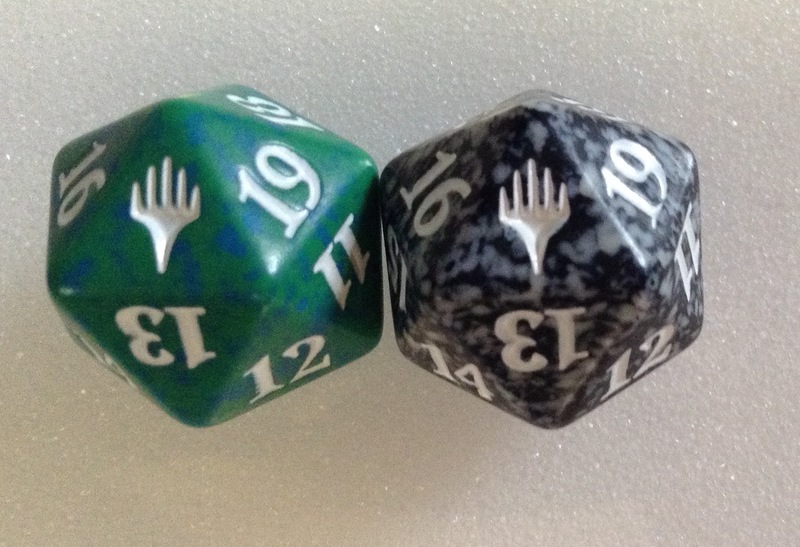 ,and comes with plenty of tokens and TWO life counters. The Wizards went over the top this time. 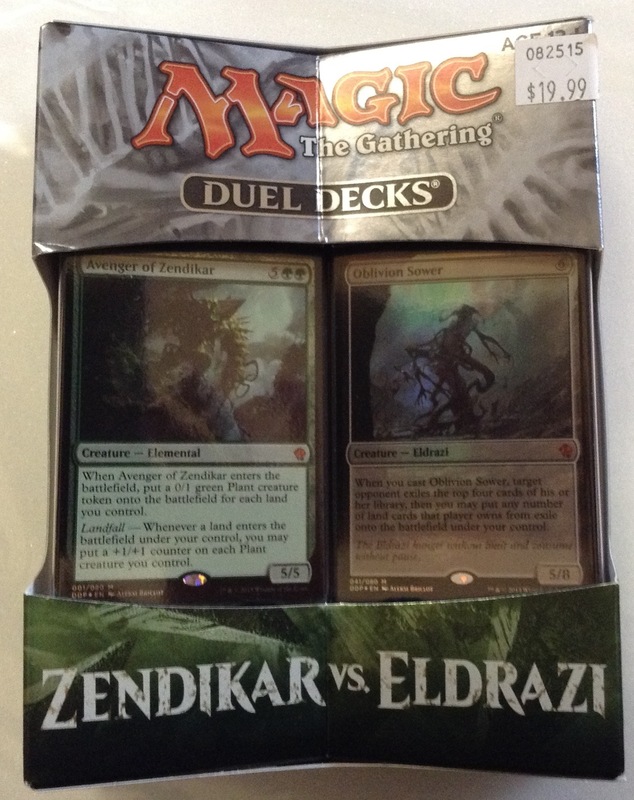 SpartanNerd rates Duel Decks: Zendikar vs. Eldrazi a 5/5. Do you agree or disagree? Let me know in the comments!